The county of Venaissin is so called, as some say, "a venatione" (after hunting), because it is a sporting country, or as others pretend, from Venasque, formerly an imperial city, and the chief of the country. It is subject to the Pope and contains: 1. The diocese of Avignon; chief town Avignon. 2. The diocese of Cavaillon; chief town Cavaillon. 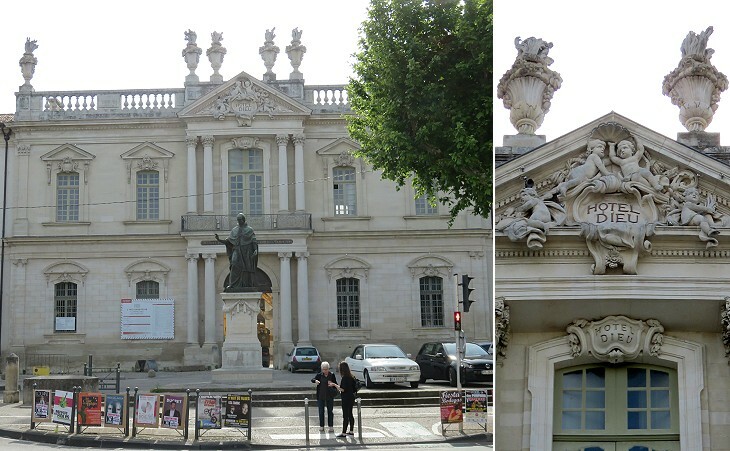 3.The diocese of Carpentras; chief towns, Carpentras and Pernes. 4. The diocese of Vaison; chief town of the same name. The Popes were bequeathed Comtat Venaissin by Alphonse II, Count of Toulouse in 1271. In his will he left most of his fiefdoms to his nephew King Philip III of France, but Comtat Venaissin, was nominally part of the Holy Roman Empire and the Crown of France had no rights on it. In 1274 Pope Gregory X met with Philip and convinced him to accept the Papal sovereignty on Comtat Venaissin. It was a Papal possession until 1791 when it was annexed to France. 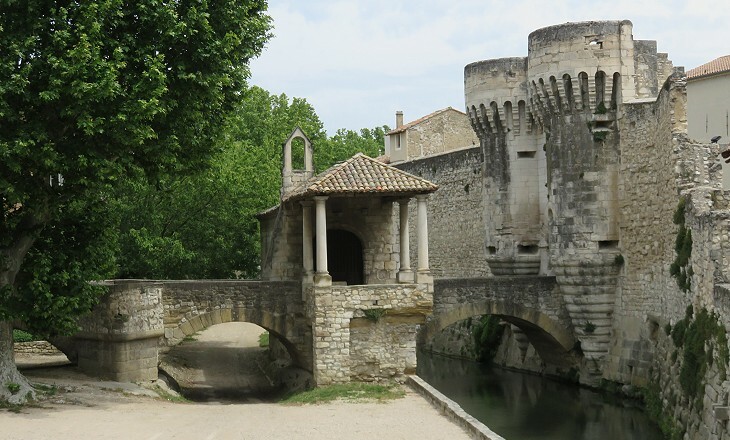 Carpentras, the second town in the department of Vaucluse is agreeably situated, commands a fine plain planted with olive trees, and is surrounded with walls. 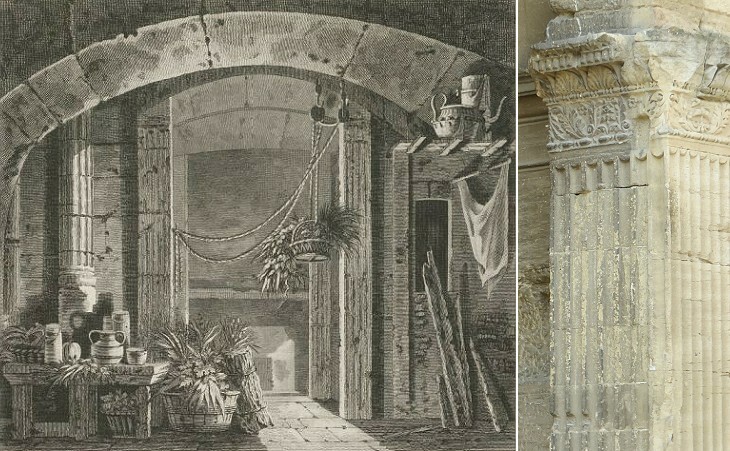 (..) The objects of curiosity are a noble aqueduct built after the antique (..), the remains of a triumphal arch in the lodge of the prison, the episcopal palace, the front of the cathedral, the grand hospital of which the façade and principal staircase are very fine and the public library. The Popes did not attach much importance to Comtat Venaissin until 1313 when Pope Clement V placed his residence at Carpentras, after his anointment at Lyon in 1305 and after having spent some years in other towns of France. 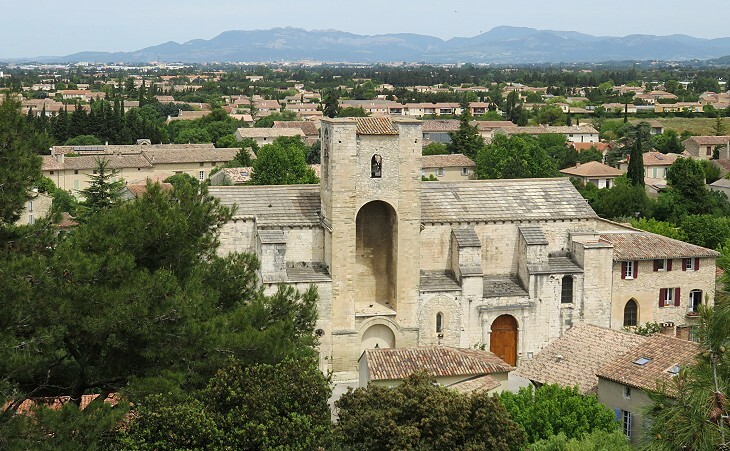 Pope John XXII, his successor, moved the Papal Court to Avignon in 1316, but Carpentras continued to be the capital of Comtat Venaissin. 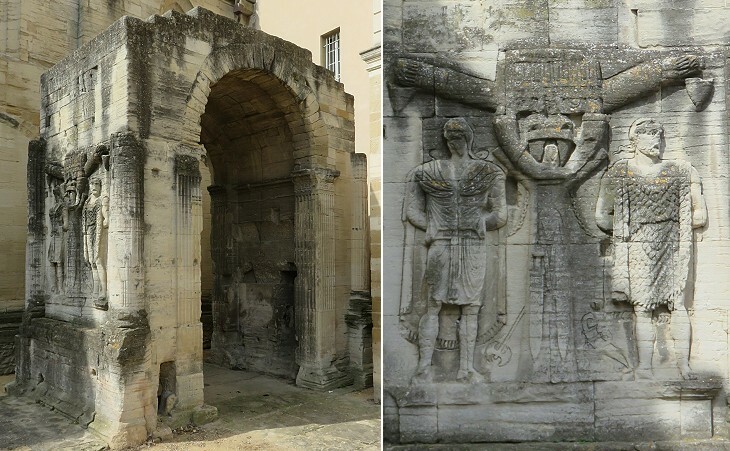 Carpentras was an important Roman station, but almost the only relic of that people remaining is an Arch of Triumph, formerly built up into the bishop's palace, and serving as his kitchen, but recently set free from that degradation, and detached from the buildings surrounding it. It is a ruin reduced to the mere stone vault without the attic resting on the side piers. Upon these are curious sculptures in relief representing Barbarian Captives, their hands bound behind their backs to trophies. Nothing is known of the date or destination of this arch, but it is doubtless a work of the Lower Empire. The two figures were identified as a Parthian (left) and a German (right) captive warrior and this led archaeologists to date the arch at the time of Emperor Tiberius or in the very last years of Emperor Augustus, when the Empire was at war with these two peoples. The arch was therefore erected in the same period as that of Orange, which also has a similar decoration on its short sides. 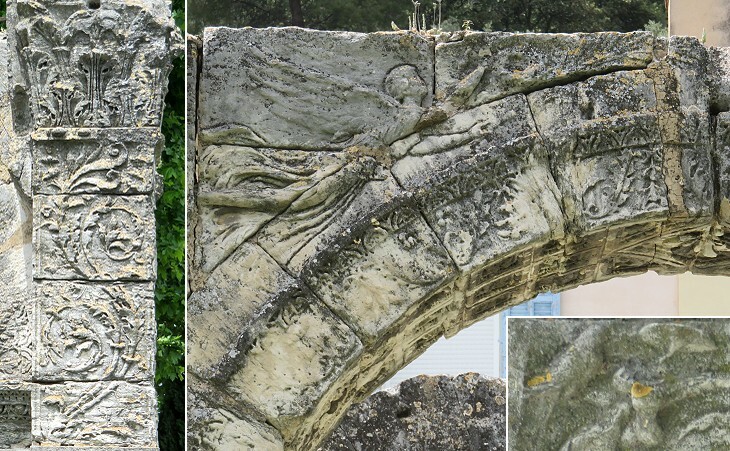 The arch was moved from its original location, presumably across one of the main streets of Carpentoracte, the Roman town, to the XIIth century Cathedral where it decorated one of the entrances. It ended up by being incorporated into the kitchen of the adjoining Bishop's Palace when the Cathedral was rebuilt. 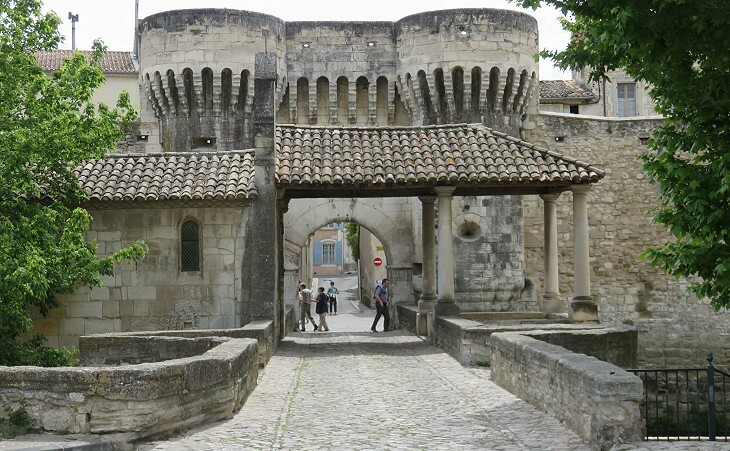 Carpentras was a bishopric see since the Vth century, but from ca 590 and for many centuries its bishops preferred to reside at Venasque, a small town in a more defensible position than Carpentras. 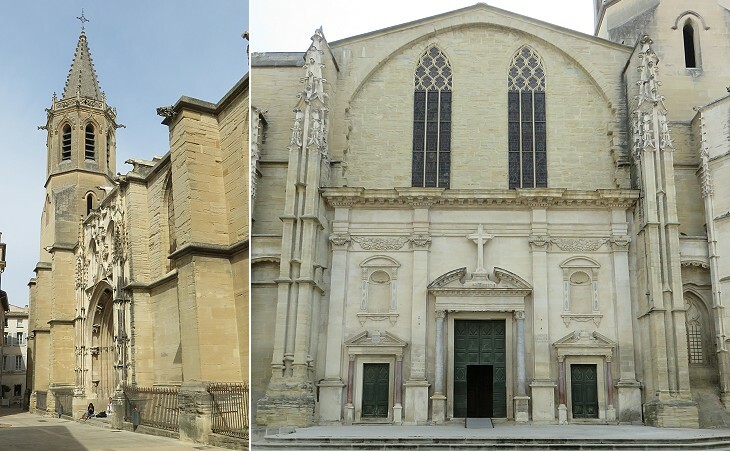 After Comtat Venaissin was acquired by the Popes, the diocese of Carpentras became an important one and it was assigned to close relatives of the Popes when these lived at Avignon. 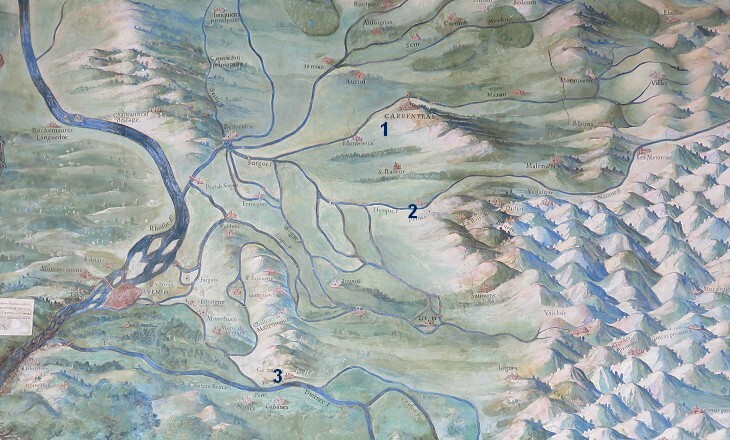 It was merged with that of Avignon in 1801, but it was recreated in 2009. Petrarch, a famous Italian poet, lived at Carpentras, where his father worked at the Papal Court, in 1312-1316. During this period he visited for the first time Fontaine-de-Vaucluse, a natural spring surrounded by high rocks which eventually became a source of inspiration for one of his most famous poems. 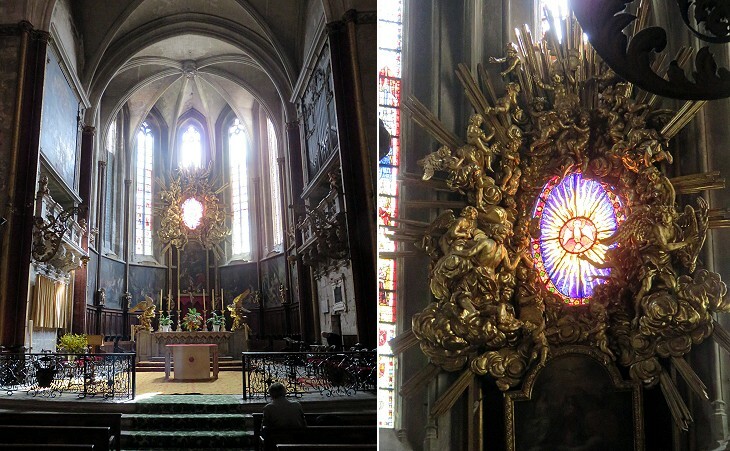 In 1692 Bishop Lorenzo Bussi, from a Roman noble family that enlisted three cardinals, commissioned Jacques Bernus with a complex wood decoration for the apse of the Cathedral which clearly was influenced by Roman models and in particular by works by Gian Lorenzo Bernini at S. Pietro. 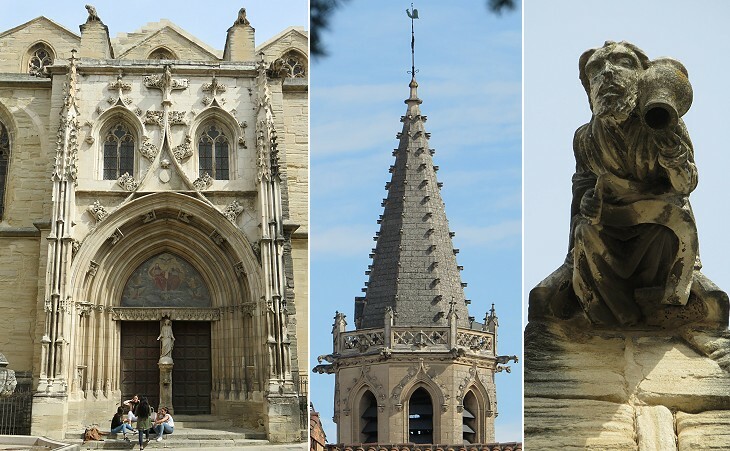 Bernus was the son of a local sculptor; Bishop Bussi praised so much his work that he encouraged him to go to Rome to learn marble sculpture, but he refused to leave Carpentras and he continued to make wood decorations for the churches of the region. Alessandro Bichi was appointed Bishop of Carpentras in September 1631 and Papal Nuncio (Ambassador) to France a few days later. In 1633 he was made Cardinal by Pope Urban VIII. He established friendly relations with Cardinal Jules Mazarin and he was always a supporter of the French cause at the Papal Court. He was rewarded by France with revenues from abbeys and fiefdoms which allowed him to build a grand Italian-style palace at Carpentras. He was buried at S. Sabina in Rome. 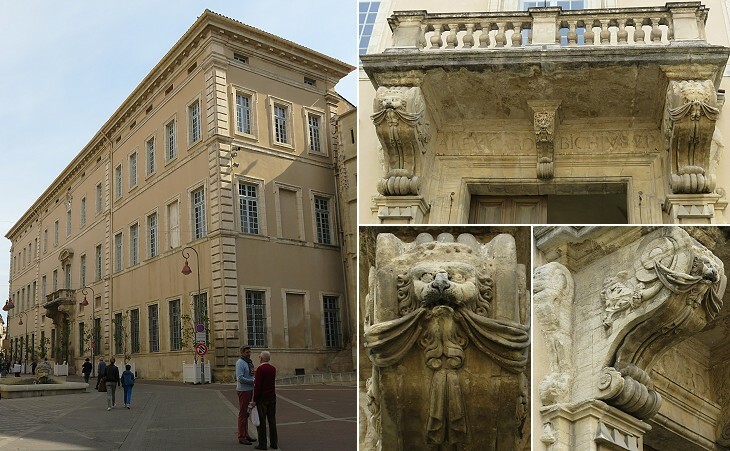 Similar to what occurred at Rome, also at Carpentras institutions were founded to care for the poor and the sick. Joseph-Dominique d'Inguimbert, Bishop of Carpentras in 1735-1757, built a very large hospital with wings arranged around four courtyards. It replaced five previous hospitals which were no longer suitable for their purpose. A statue of the Cardinal was erected in 1858 in front of his hospital, a very unusual sight in France, where, first the French Revolution, and then a very lay legislation on religious matters, have destroyed or greatly limited such monuments. 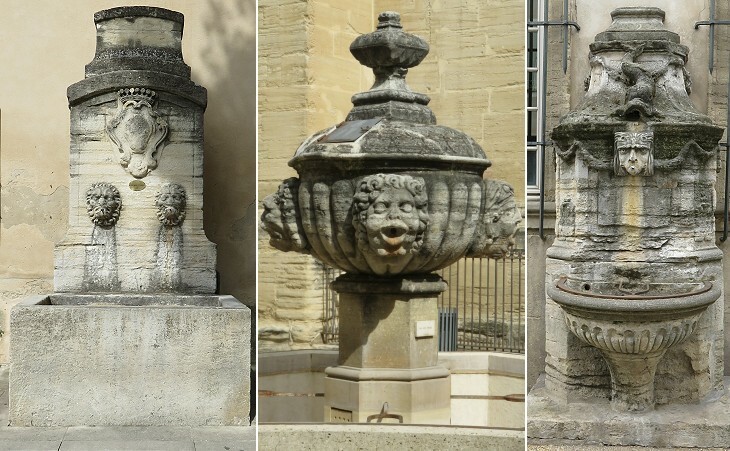 In 1734 a short aqueduct was completed to provide Carpentras with an ample supply of water and a number of public fountains were built to distribute it, but not as many as at Pernes-les-Fontaines. 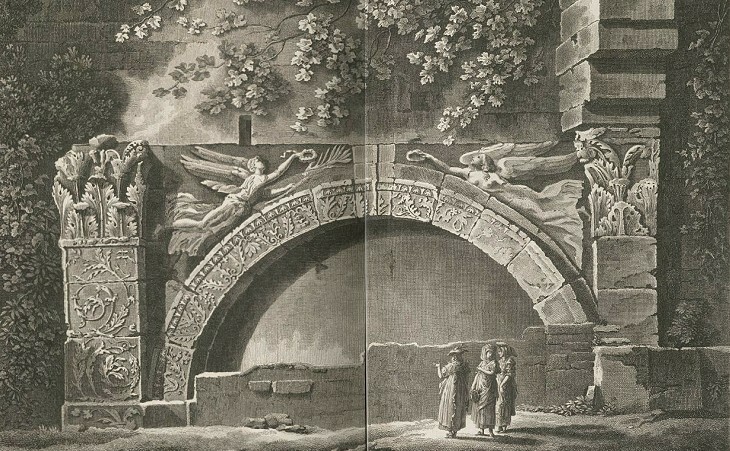 The plate by Laborde shows an apparently gigantic fragment of a Roman monument in a garden. It decorated the Bishop's Palace of the town until the building was sold in 1793 and it fell into abandonment becoming itself a ruin. Laborde wrote in his book that other fragments were visible near that of the plate. 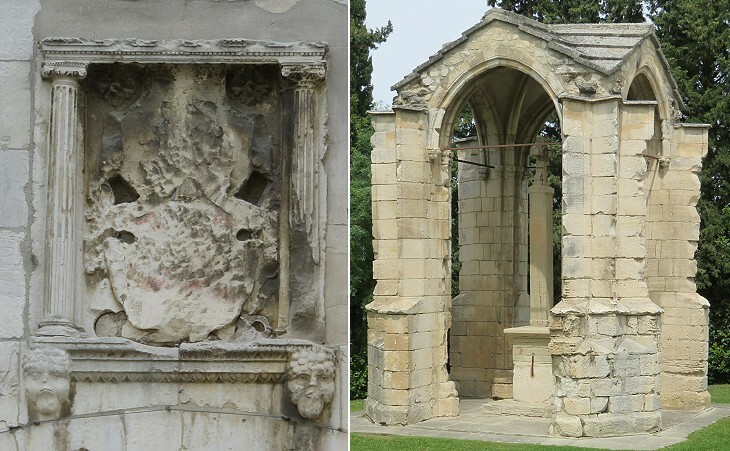 The fragments were studied and eventually reassembled in order to reconstruct two identical small arches. They were placed in a new location and in a way which suggests that the original monument was a tetrapylon, an arch with four equal sides at the junction of two important streets. The best known example of tetrapylon is that at Palmyra, but, because of its small size, that at Cavaillon might have resembled the Arch of Marcus Aurelius at Oea (Tripoli). No inscriptions were found which could help in dating the arch, so archaeologists had to study on its decoration to establish when it was built. In this part of Provence there is an imposing arch at Glanum, in addition to that at Orange, but the decoration of the arch of Cavaillon does not seem to have been influenced by them, a fact which suggests it was built before them, perhaps shortly after the completion in 9 BC of Ara Pacis Augustae, the altar dedicated to Augustus by the Roman Senate. This opinion is supported by the similarities between the acanthus scrolls of the two monuments. 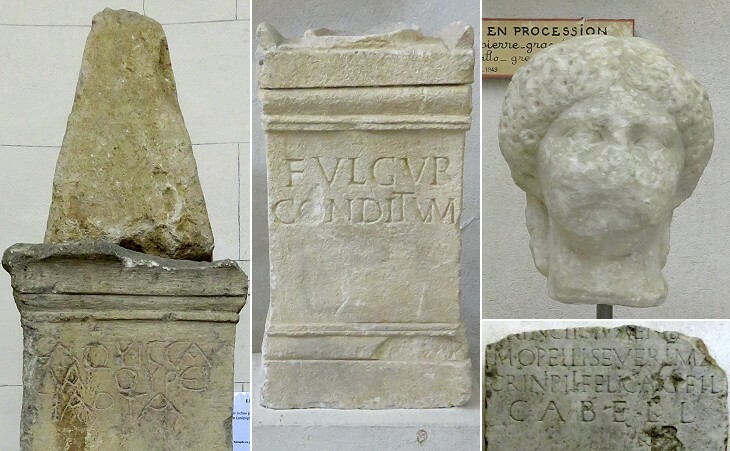 In 1938 a small archaeological museum was opened in a deconsecrated chapel, similar to what occurred at Vienne and Avignon. It contains exhibits which testify to the long history of the town, including the influence of the Greek colony of Marseille on the local population before the Roman conquest. In the introductory page to this section you can see a relief depicting a boat carrying wine and olive oil on the River Durance, which was found near Cavaillon. The Cathedral was dedicated to Saint Veranus of Cavaillon who in the VIth century lived as a hermit at Vaucluse before being appointed Bishop of Cavaillon. The town was less important than Carpentras, but its economy could rely on a very fertile countryside. In 1864 Alexandre Dumas received a request from the librarian of Cavaillon, who asked him for a few volumes of his works. He answered "If the city and the authorities of Cavaillon value my books, I love their melons very much and I desire that in exchange for my 300 volumes, a life annuity of twelve melons per year be constituted for me". The City Council accepted this offer and delivered his twelve annual melons to Alexandre Dumas until his death in 1870. The Cathedral was sacked and partially burnt during the "First" French War of Religion (1562-63). 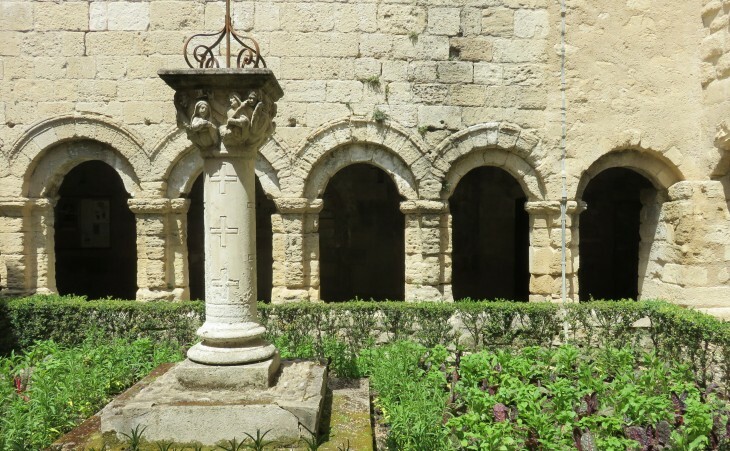 It was restored in the following century, but these events did not impact on the small cloister. 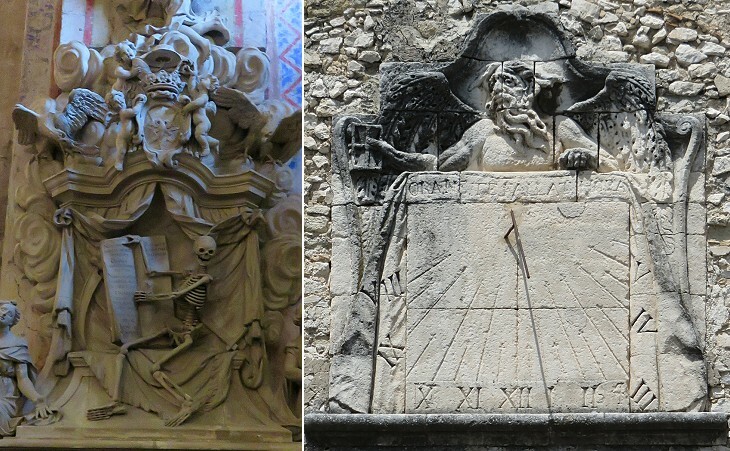 Former Cathedral: (left) 1710 monument to Jean-Baptiste de Sade de Mazan by Jean André Maucord; (right) sundial with inscription "Ora ne te fallat hora" "Pray that the hour take thee not unawares"
Memento Mori is a page of this website which covers funerary monuments and decorative elements which reminded the Romans of their death. 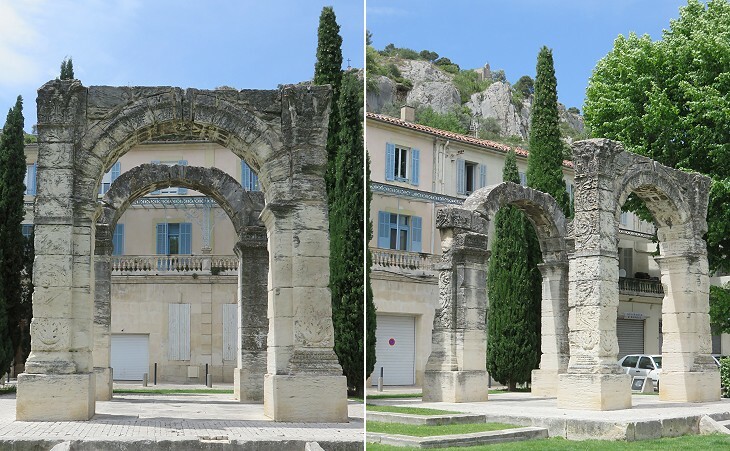 They were in fashion in the XVIIth and XVIIIth centuries also at Cavaillon. The Kings of France decreed the expulsion of the Jews more than once; in particular in 1394 (Expulsion Finale) and in the early XVIth century from their new territories in Provence. Avignon and Comtat Venaissin were the only parts of Southern France where they were allowed to live, although they were subject to restrictions and vexations similar to those enforced in Rome by Pope Paul IV. Their living conditions depended very much on the benevolence of Bishops and Papal Legates; their synagogues and religious schools were not allowed to have a proper street façade. 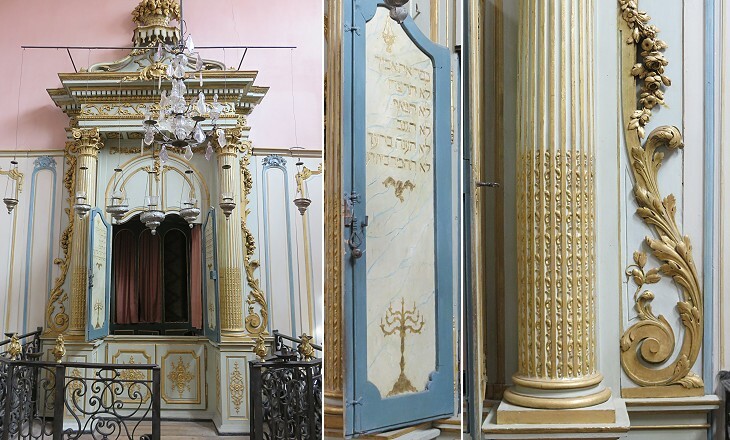 In 1772-74 the small Jewish community of Cavaillon managed to redecorate the Synagogue in the fashion of the time. The synagogue was closed in the XIXth century because the Jews left the town. Luckily in 1924 it was listed among the historical monuments of France and in 1963 it was turned into a small museum. 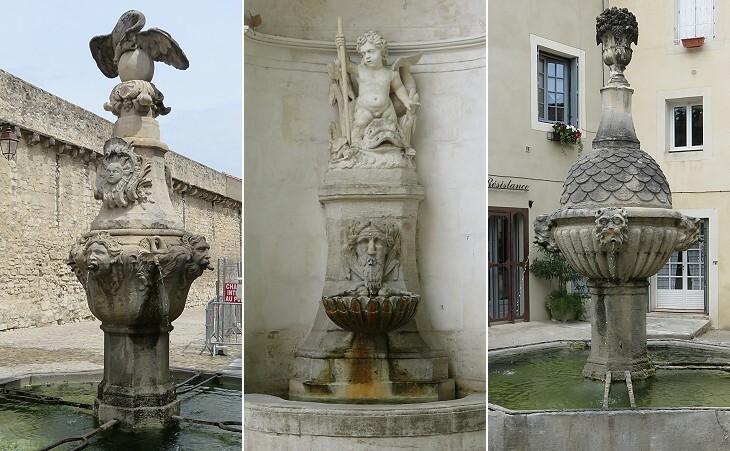 This small town was the capital of Comtat Venaissin when it belonged to the Counts of Toulouse, but it was soon replaced by Carpentras. In 1936 the suffix les-Fontaines was added to underline its main touristic attraction. It is crossed by the River Nesque which empties into a branch of the River Sorgue. The section of the town on the left bank of the Nesque was protected by walls which were strengthened in 1548 by the construction of a new imposing gate at the end of a bridge on the Nesque. 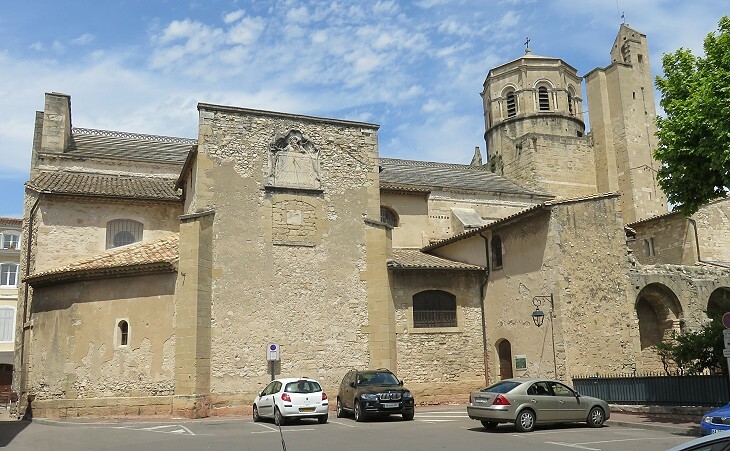 It is named after Notre-Dame-de-Nazareth, the most important church of Pernes, which stands on the other side of the river on the road leading to Carpentras. In 1915 the gate, the bridge and the chapel of a local guild were declared historical monuments, a decision which ensured they were not sacrificed to the needs of modern life. They make a very evocative view and per se justify a visit to the town. Also Pont Saint-Bénézet at Avignon had a chapel on it. The French Revolution had an impact also at Pernes where all references to the Popes were erased (see a page on what occurred in some Papal towns in Italy). In addition a column with a cross was replaced by a pike with a Phrygian red cap, a symbol of the Revolution. It stood in a sort of small tetrapylon which was erected in 1433 to celebrate the visit of Cardinal Pierre de Foix who restored the authority of Pope Eugenius IV over Comtat Venaissin after the Great Schism. This church was built in the XIth century as part of an abbey. 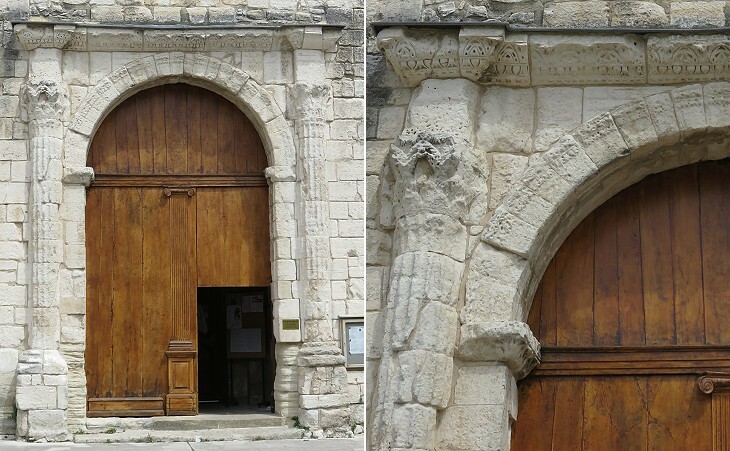 Similar to the Cathedral of Cavaillon it was damaged in 1562, but its southern portal retains its original design and decoration which definitely resemble those of a Roman building (the lintel perhaps is an ancient one). The Romanesque of Provence has all the delicacy of an advanced art bestowed on the simple and strenuous forms of a round-arched style. The interior retains some other elements of the original church, which show how much Romanesque art is indebted to the Roman one (you may wish to see also Saint-Quenin at Vaison-la-Romaine). 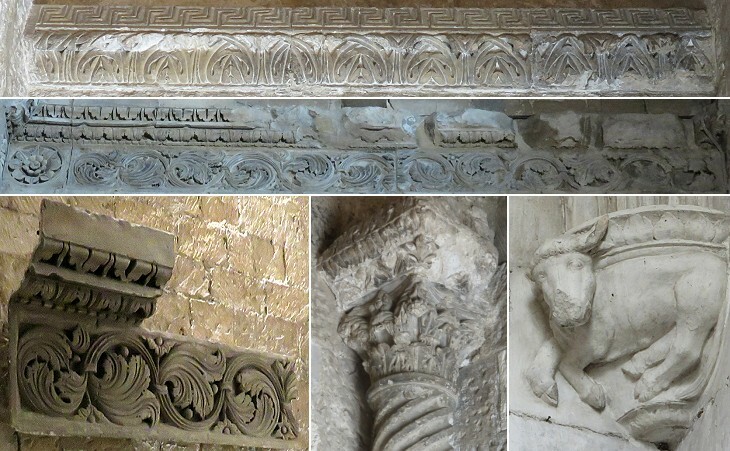 In most part of Europe Romanesque art was inspired by models which were first developed in Lombardy (see an example in Rome), but in Provence it was directly influenced by the ancient monuments of the region. 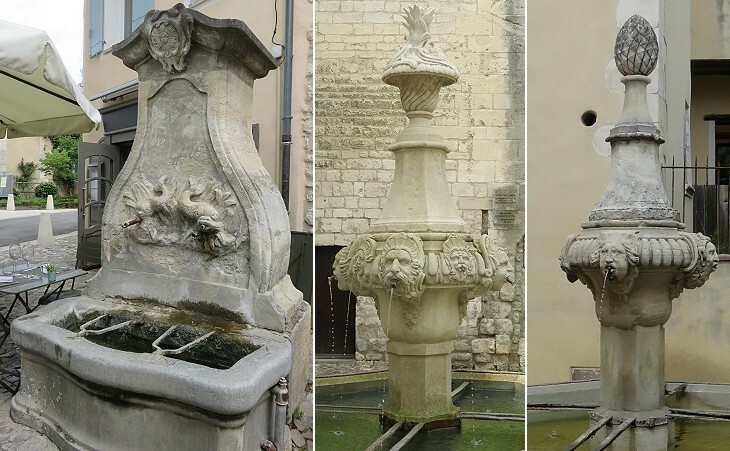 The oldest records about the fountains of Pernes are dated XVth century, but most of the fine public fountains which embellish this small town were built after a new spring of pure water was found by chance in its outskirts in 1750.